The Head of the University of Liverpool’s Institute for Ageing and Chronic Disease has been awarded the highest honour in the UK in the field of gerontology. 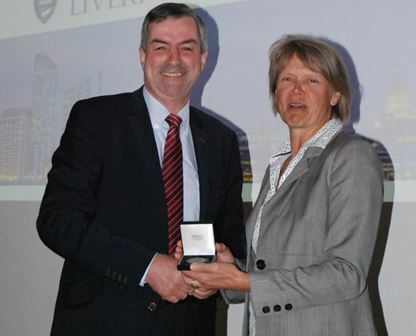 Professor Malcolm Jackson was presented with the British Society for Research on Ageing’s Lord Cohen Medal in recognition of his contribution to ageing research at their annual meeting hosted this year by Liverpool John Moores University. Professor Jackson specialises in issues around ageing and molecular and cellular physiology. As well as being head of the Institute, he is also Director of the MRC-Arthritis Research UK Centre for Integrated Research into Musculoskeletal Ageing (CIMA), as well as serving on the MRC Population and Systems Medicine Board and the Joint Research Councils’ Life Long Health and Wellbeing panel. Earlier this year, he was awarded the Edward F Adolph Distinguished Lectureship by the Environmental and Exercise Physiology section of the American Physiological Society, at their Annual Scientific Meeting at the Experimental Biology conference in San Diego. The Lord Cohen medal is awarded only occasionally and is named after the physician Henry Cohen. This year it was presented by Professor Helen Griffiths, Chair of the Society.